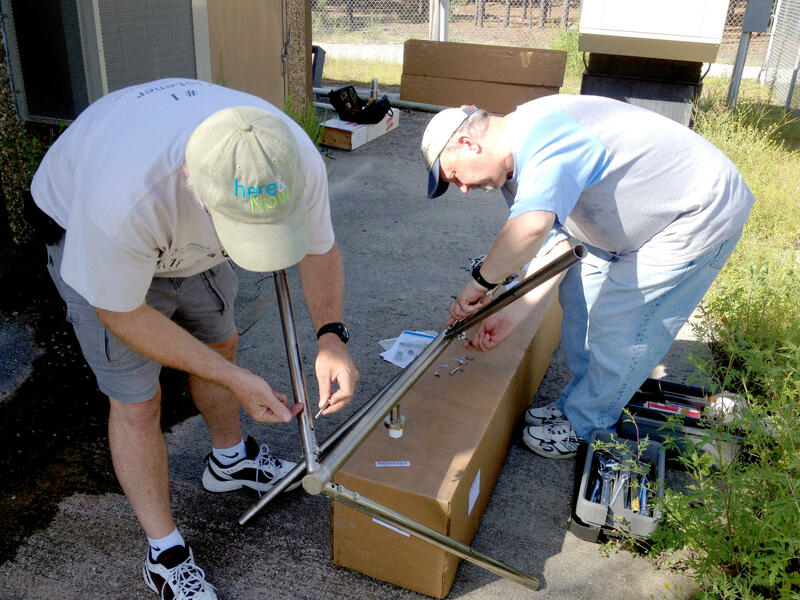 This is a picture of Jobie Sprinkle and George Scheibner assembling an antenna for a new FM station. We'll have more to say about this soon. Hint, hint. [I] Love your programming and appreciate all you add to the Wilmington community. [I] am wondering about the schedule for This American Life, normally heard noon on Saturdays with a rebroadcast the following Friday at 7:00 PM. However, several times in the last few months, there has been a new broadcast on Friday nights, which was repeated the following day at noon. We record these shows for later broadcast, and the distribution method and time have changed for This American Life. Operationally, it is now more efficient for us to record it prior to Friday, and repeat on Saturday. And it makes promoting the shows easier to do as well -- for example, we no longer have to spell out that one program will be on Saturday, whereas another program will be on Friday. Actually, I prefer the new episode on Friday with a repeat on Saturday and have been pleased with this new schedule so unless you receive complaints, please keep it this way… bravo to your excellent team, broadcasting and contributions to our community. I was disappointed in the "news" report on Sat, Aug. 30 on [Thom] Goolsby. While it may be news that he has formed a lobbying practice, to lobby in the State Senate that he just resigned from, I believe the part of the report - quoting from the Star News, which is where I think the story came from, "While he's open to hearing from anyone who might be interested in his services, Goolsby said he's particularly interested in lobbying for economic development, pharmaceutical companies and he health care industry." This sounds more like an advertisement for customers. Please limit the news to news and not ads. As our newscaster indicated on the air, this was taken from a story in the StarNews. We believe that identification of the types of clients Mr. Goolsby will be seeking is a legitimate aspect of the story and one that listeners might want to know. The BBC provides an excellent non-American opinion on news. Not only do they offer a different slant, but they also bring other stories that are not covered by USA news channels/newspapers. I grew up listening to NPR in Rochester, NY (WXXI). Great station. Fortunately, we were close enough to the Canadian border to receive CBC (Canadian Broadcasting Corporation …) The CBC newscasts … opened my eyes to appreciate other opinions and ways of life. On 9/11 … I was at home due to illness and watched the carnage as the World Trade Center crumbled. That night, and for many nights following, I listened to the BBC and their foreign correspondents. American stations were broadcasting surprise, "How could this happen here?" The BBC and other stations were of a different opinion: "America was a target. It was just a matter of when." … Please keep the BBC nightly news. America can't solve the world's problems alone...everything is a global issue now. Thank you. Thank you, Judy. Stay tuned for more news about the BBC, coming up in the next few weeks on WHQR.